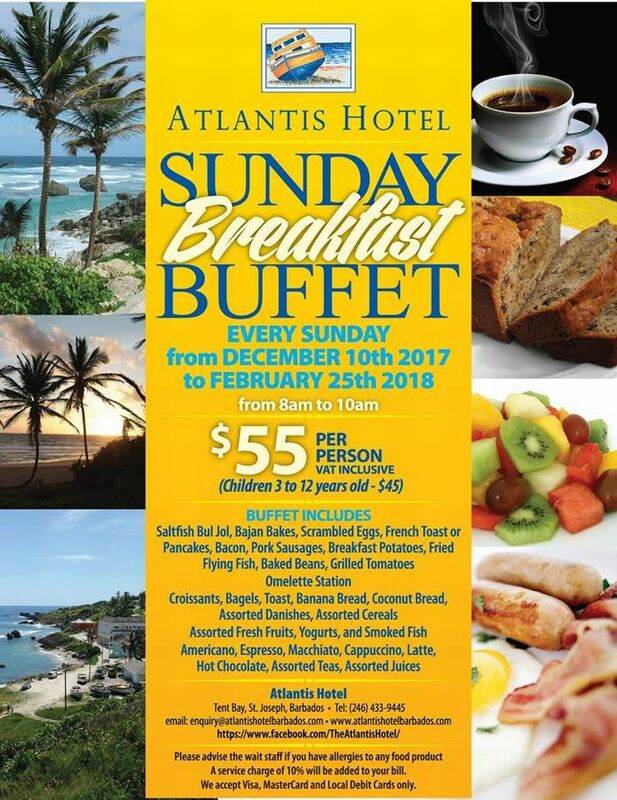 *** The Breakfast Buffet is now available every Sunday from Dec 10 2017 to Feb 25 2018. 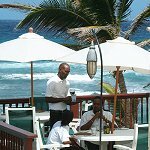 The old Atlantis Hotel, for a period of over 50 years, provided the most famous Sunday Lunch Buffet in Barbados. Tourists and locals alike flocked in droves to this iconic event. The old Atlantis Hotel is no more. In its place is a spanking new hotel. And in addition to its famous Sunday Buffet Lunch served every Sunday, they now have, on the second and last Sunday of every month, a special Second and Last Sunday Buffet Breakfast. "We get the sun first everyday... but we love sharing". 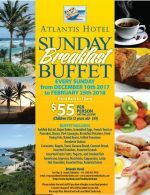 The spread includes fresh fruit salad, bacon and eggs, Pork sausage, fried flying fish, grilled tomatoes, sautéed potatoes, baked beans, banana bread, coconut bread, bul jol and bakes, fresh coffee, and a selection of juices. See attached menu for more information.